With a street price of about a hundred bucks, the 5530 is a good, affordable contender the next time you need a multifunction printer for your home. 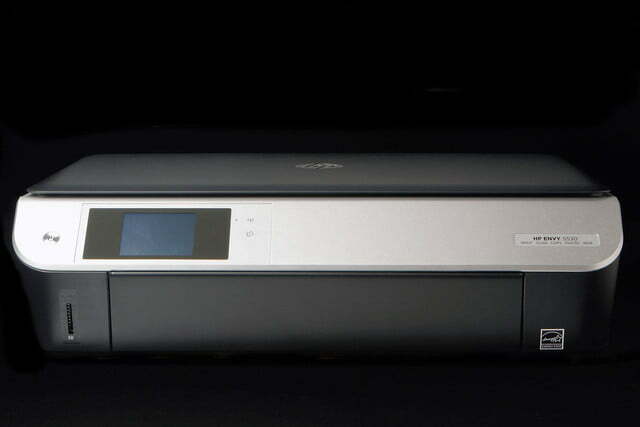 The HP Envy 5530 is an attractive-looking multifunction printer designed for the home user (no fax, but few would need that these days). With a manufacturer’s list price of $130, it’s also an affordable printer to buy. You might think that the device won’t perform as well as more expensive models, but our tests revealed that the 5530 actually makes very good quality prints, and is a good option as long as you don’t need to scan-to-print often. 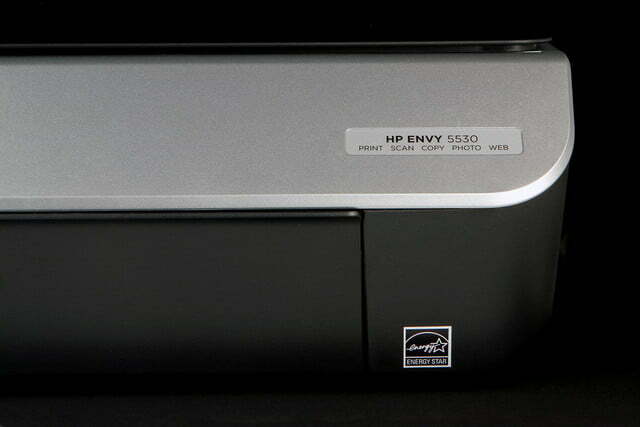 The Envy 5530 is an attractive MFP. It’s has a glossy black-and-silver exterior, and on the angled front-panel is 2.65-inch color touchscreen display, where all the functions are accessible. Underneath is a drop-down panel that exposes the paper tray and a swing-out paper output support. 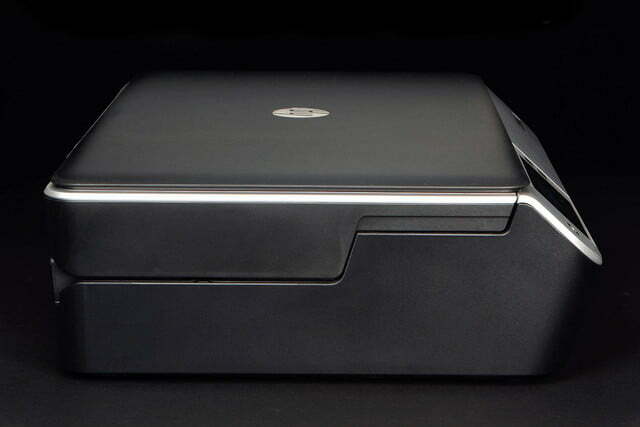 The paper tray has a capacity of 100 sheets, which is rather small but should be sufficient for most home users; the output tray supports 30 pages. 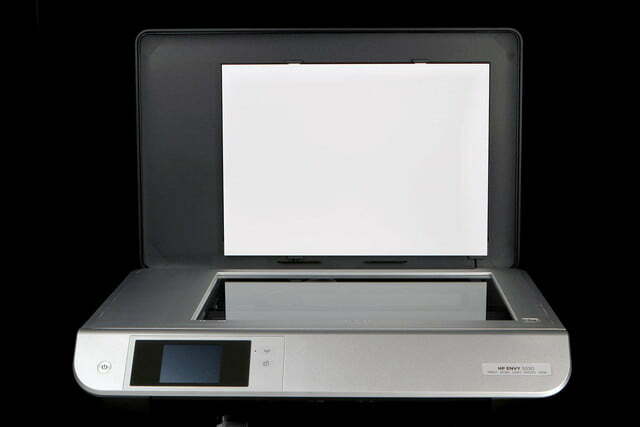 There’s no automatic document feeder for easy scanning of multiple pages, but there is automatic duplexing. Also on the front is a slot for an SD memory card. 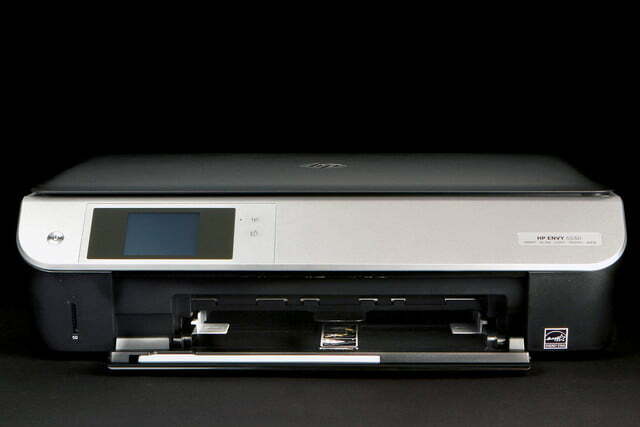 You can print images stored on a card using the 5530’s touch panel – there’s no need for a PC. You can also scan directly to the card, in addition to a PC or email (if the unit is connected to the Internet). The 5530 doesn’t support any other flash memory format or USB drive, which is unfortunate as the latter option is a useful one. Speaking of Internet, the 5530 supports either a Wi-Fi connection to a home network or a direct Wi-Fi connection with a device. 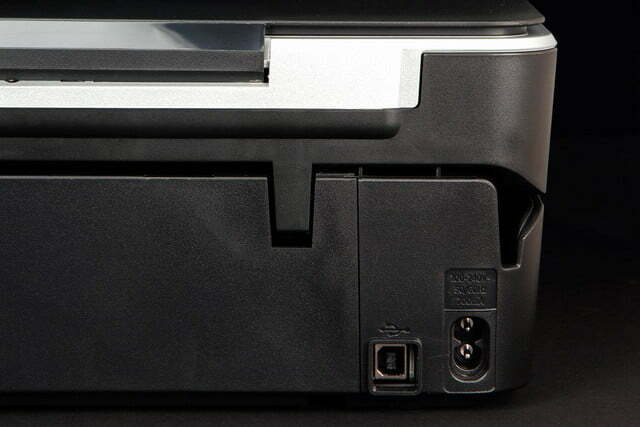 The 5530 also supports a regular USB connection, naturally. Given that the 5530 targets home users, the lack of an Ethernet connection is not a minus. The 5530 uses two ink cartridges, one with black ink and the other is a tri-color cartridge with cyan, magenta, and yellow. This is a rather old-fashioned approach: when one of the three color inks runs low, the entire cartridge needs to be replaced even if there’s plenty of the other two colors. 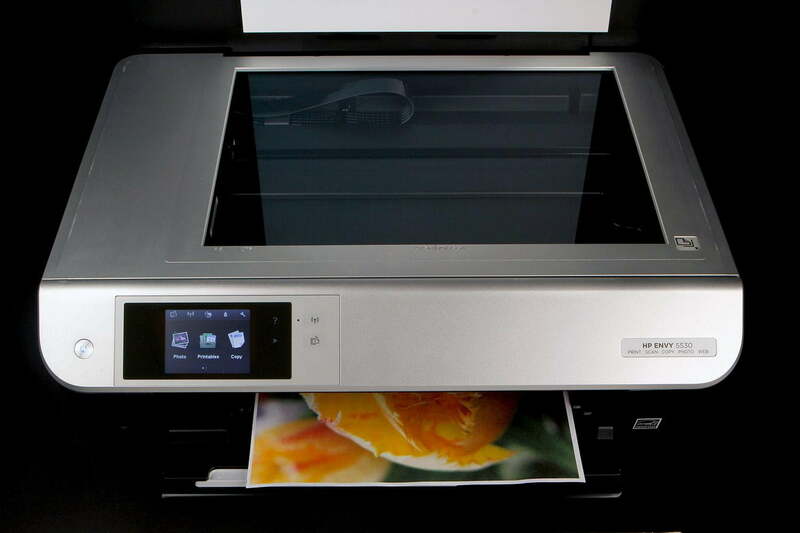 In turn, this makes printing pages with large amounts of coverage, such as photos, much more expensive than with a printer that uses separate cartridges for each color. Standard capacity cartridges are rated at 180 pages for the $15 black cartridge and 150 pages for the $20 tri-color cartridge. The larger capacity XL cartridges are rated at 455 monochrome pages and 310 color pages ($30 for black, $32 for color). 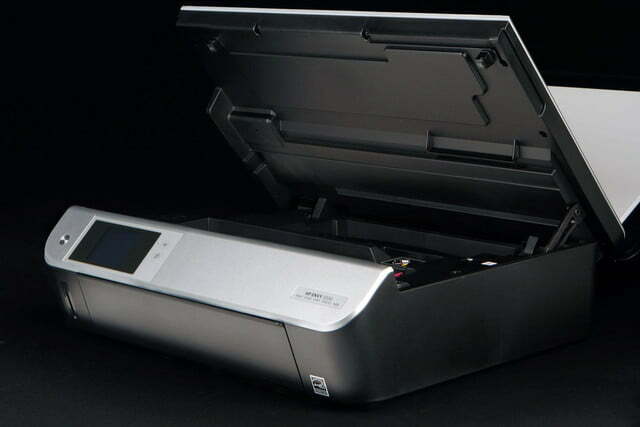 One unique thing about HP’s inkjet printers is its Instant Ink program. When you register for the program (it’s optional), you are billed a monthly fee based on the number of pages that you expect to average. The least expensive level is $3 for 50 pages. If you print more than the number of pages your plan provides for, you are billed a per-page charge for the overage. If you don’t use all of the pages in a month, the unused pages roll over. When the printer starts to run out of ink, the unit sends HP a message over the Internet and HP sends out a new cartridge. 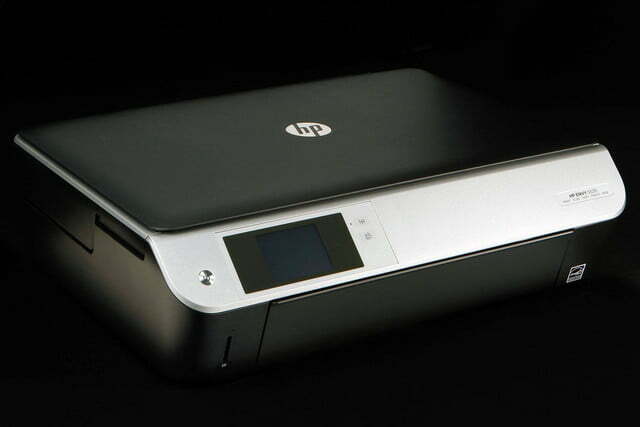 The idea is that you’ll never face a situation where you’re out of ink, and HP says printing costs will be a lot less; it’s economical if you print lots of photos. Not every user will find this service beneficial, but those who don’t want to hassle with worrying about buying ink might find it attractive. The Envy 5530 is relatively compact (17.5 x 13.2 x 4.7 inches, without the output paper support extended) but it isn’t the world’s smallest or anything like that. At 12.3 pounds, it’s easy to handle yet surprisingly sturdy. Besides the printer, there’s power cord, setup poster, and a basic startup booklet that’s not particularly useful. Two ink cartridges are included. There’s also an installation CD that comes with the print and scan drivers, and HP’s Photo Creations applications for printing calendars, photo cubes, greeting cards, and other crafts – a nice addition for home users. 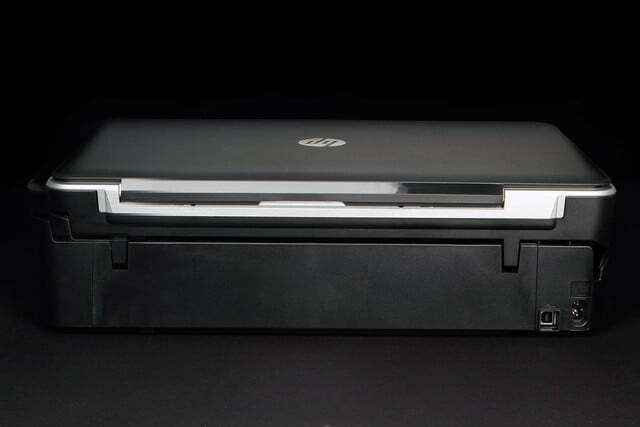 Installing HP devices has always been easy, and the 5530 is no exception. You can go through the installation process via the included disc (it takes just a few minutes), or add the printer manually through your system settings (Windows or Mac), although you may need to download the drivers with the latter option. 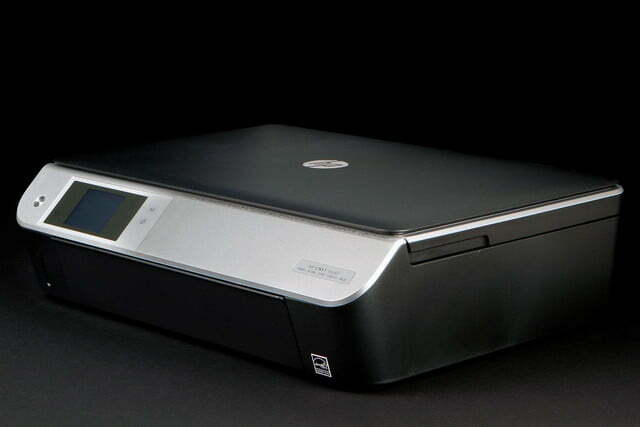 If you use the disc installation, you can also set up a free HP account to use the ePrint capabilities. 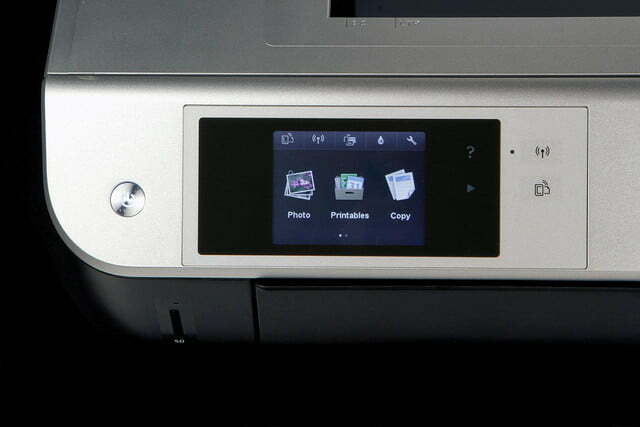 The device also supports Apple AirPrint, Google Print, and many other wireless print technologies. Unlike the last Envy device we tested, this install did not badger us with incessant messages about joining the Instant Ink program. We were very pleased with the performance in our testing, in both speed and image quality. At the end of the installation, the printer needs to perform an alignment. 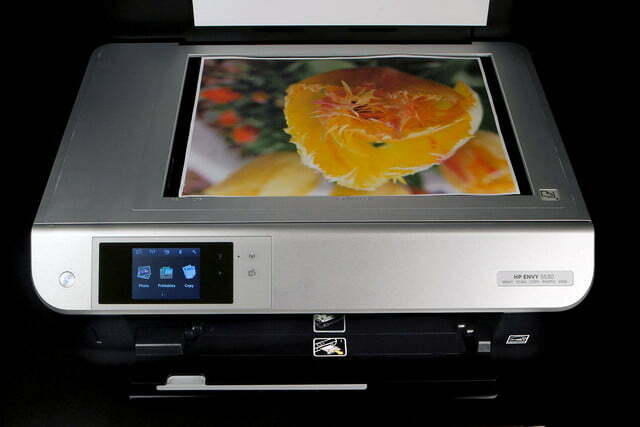 This is a quick process consisting of printing a test page, placing it on the scan bed, and scanning the printed page. The process took 2 minutes and the only user interaction required was placing the printed page on the scan bed. We were very pleased with the 5530’s performance in our testing, in both speed and image quality. HP rates the 5530’s print speed at 8.8 pages per minute in monochrome and 5.2 ppm in color (default normal resolution setting). We printed multiple copies of a four-page document that is mostly monochrome text with a small color logo. Using this test, the 5530 turned in a respectable 8.5 ppm. It’s not a speed demon, but it’s also not sluggish. We tested image quality using two papers: HP’s Bright White and HP’s Advanced Glossy Photo Paper. The quality of the output on Bright White, which carries a price premium over inexpensive copy paper, was very good. Colors were somewhat undersaturated and a bit dull, but were spot on as far as the accuracy of the color in the image. 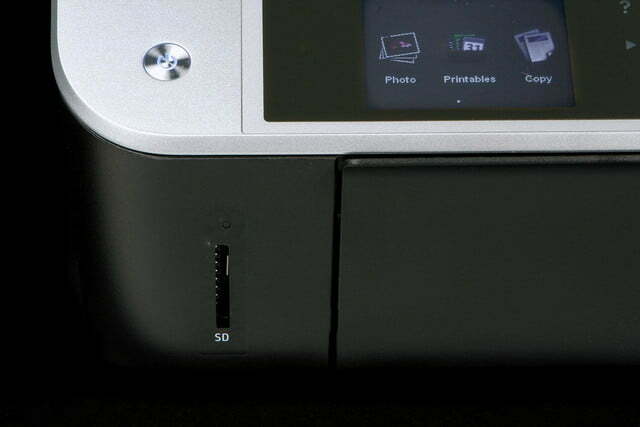 HP claims that the 5530 is a photo-quality printer. With the Advanced Glossy Photo Paper that HP sent for us to use, it certainly backs up that claim. There were very slight differences in saturation between out test output and the reference prints we use for comparison. But even with those very slight differences, we didn’t have any complaints about the printed output. Copy speed is typical inkjet slow. You’re not going to want to make lots of copies using the 5530. The specs state that you can make up to 50 copies. Unless you have an awful lot of time, you probably wouldn’t want to try. Scanning-to-print is not great, resulting in prints with visible banding. The only area where the 5530 truly disappointed us in performance was in scanning. Scanning is easy, and the unit has a TWAIN driver that was recognized by Picasa’s Import feature. But scanning the color checker reference print and printing it out, resulted in an output print with visible banding. As mentioned, the 5530 doesn’t offer great page yields and we don’t like having to discard a semi-full tri-color tank of ink just because one has run out. 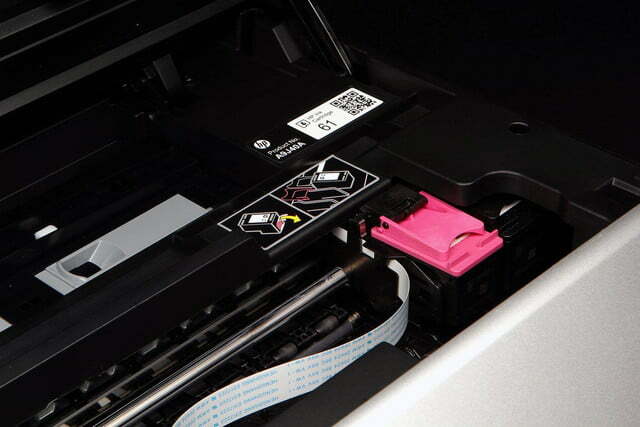 HP’s Instant Ink program lets you fix the cost per print. At its lowest level of $3 for 50 prints a month, a color print costs six cents a page, regardless of how much of the page is covered with text or image. For the type of user that the 5530 is aimed at, who will be printing lots of crafts and photos, that seems like a good way to go. Evaluate your printing needs before you sign up, however. Designed specifically for the home user, the Envy 5530 does a good job of providing a nice feature mix in a very attractive package. The 5530 proved a little disappointing in print quality that’s made from a scan, but it is otherwise capable of generating excellent photo quality output from an image file. We were also unimpressed with cartridge yield, and the use of the outdate tri-color ink cartridge seems wasteful. No one wants to know that they are tossing a cartridge with usable amounts of two colors if a third color runs out. With a street price of about a hundred bucks, the 5530 is a good, affordable contender the next time you need a multifunction printer for your home.